Yo whats up everybody…. just a quick update on whats going on here at the beatkitchen…. for the past 6 months or so I have been getting back up to speed as far as production is concerned…. 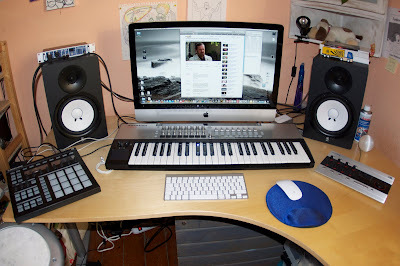 bought a great little home studio based around my iMac (highly recommend it!)….. now that that is up and running I am setting up a drum teaching studio in the village I live in… very excited about this as I have been wanting to pass on the flame to the next generation for quite some time now…. and alongside that I am also continuing work on my drum method which I am hoping (praying LOL!) will be finished soon-ish! That’s about it for the moment… will keep you posted as to how things develop!